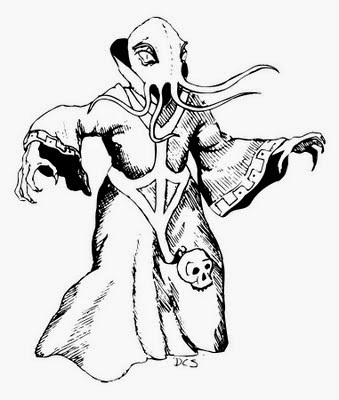 Confused (victim will act according to the results of rolling two dice: 2-5: attack the Tentacle Man or others in its party, 6-8: do nothing, or 9-12: attack his own party)—five turns. Feeblemind (victim’s actual intelligence drops to the equivalent of an animal)—permanent. The special save will be modified by distance (-2 if the victim is closer than 20’, -1 if the victim is 20’ to 40’ away) and by the victim’s wisdom modifier to Turn Undead. In addition, all Magic-Users will be at +4 to save. Ood? You have the Ood in your dungeon?! Very well, then. Allon-sy!